email account or username again, should you ever want to open another account to become a Pokemon Master. If you want no more of this Pokécraze, deleting your account just requires filling out a simple form on pokemongo support website page. If you really want a permanent break from Pokémon GO, there’s a way to get rid of the account and all the data attached to it. 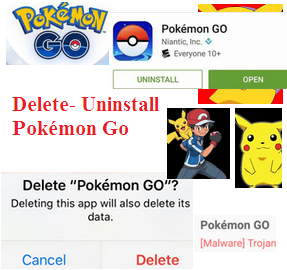 Your Pokémon GO profile and all associated game data will be permanently deleted. and finally uninstalled the app from your phone. *After Submit the form, you will get an email informing you that your request is received. If there is any instruction mentioned in email then follow it for to confirm the deletion request. and wait for up to a few weeks for the account to be deleted. Before you go through with it, know that “a profile deletion request is IRREVERSIBLE” and that “attempts to cancel the request after submitting can’t be guaranteed.